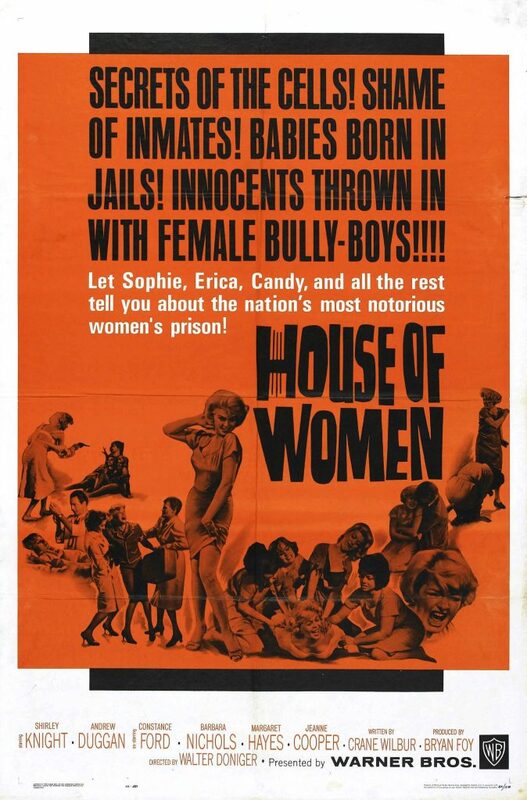 HOUSE OF WOMEN is an ultra-rarity in its own sub-genre, the Women’s Prison Picture. It’s not on the high artistic level of CAGED (1950), nor does it have the dramatic conviction of WOMEN’S PRISON (1955). Yet this film is more than worth seeing for its dynamic cast and several scenes of high, over-the-top melodrama. The great Shirley Knight was near the start of her career and she is sympathetic enough to involve viewers with her story. The rest of the cast features several nearly forgotten, but very talented actresses: Virginia Gregg, Jeanne Cooper, Barbara Nichols and another great, Constance Ford. Ford resists most opportunities to chew scenery, but she delivers a strongly entertaining performance. Also look for the still-acting-today Jacqueline Scott in a small role. On the male side, Andrew Duggan and Jason Evers do as well as could be expected in this female-dominated environment. Is HOUSE OF WOMEN camp? Well, maybe a tiny bit. But it’s a must-see for fans of this sub-genre.